Click on the picture to see LARGER faces. BACK ROW: 1.DianeWeisenburger, 2.LelandStephens, 3.CarolynGregory, 4.LindaWalden, 5.JimMaulsby, 6.SandraBuck, 7.JerryKern. 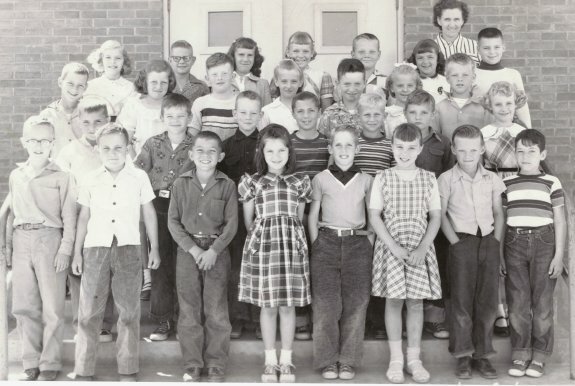 THIRD ROW: 1.JimGooldy, 2.CarlaStine, 3.DavidIsakson, 4.SandraWork, 5.NormanHill, 6.DollyKoshman, 7.BillyFranklin. SECOND ROW: 1.RalphBellandy(? ), 2.GaylorBolton, 3.MikeHughes, 4.DickPlows, 5.TedJohnson, 6._______, 7.CarolMoore. FRONT ROW: 1._______, 2._______, 3.Johnny_____, 4._______, 5._______, 6.LindaShivley, 7.BobbyHyatt, 8._______.